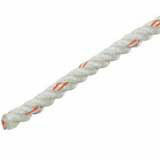 5/8" x 150' New England 3-Strand Multiline Lowering Rope Hank. 3-strand Multiline lowing rope outperforms all others as a long wearing, easy handling line for lowering limbs and equipment. A composite rope with a polypropylene core in the center of each strand securely wrapped with cover yarns of 100% polyester. Very low working elasticity and excellent rendering capability on winches affords complete load control.